You will be given a reference e-book to read which has 730 pages And the test will be based on that e-book , you can take final test within 1 year of purchase. Pain management which is also referred to as algiatry or pain medicine refers to an essential branch of medicine which employs interdisciplinary approaches that are effective in getting rid of the pain suffered by patients and improve the quality of life of anyone who experiences extreme pain. A pain management team is typically composed of practitioners in the medical industry who are responsible in helping anyone reduce the pain that they suffer. In the field of pain management, the pain is promptly resolved by healing the underlying trauma with the help of analgesics and anxiolytics. Effectively managing chronic pain which affects individuals for a longer term can also be done by coordinating the efforts of everyone in the management team. Pain management also aims to treat energy and support speedy recovery and healing. Effectively performing this process works in treating distressing and uncomfortable symptoms for certain illnesses including pain to guarantee relief from extreme suffering during the process of treatment and recovery. Among the most popular approaches that are now used in the pain management field are pharmacologic measures including antidepressants, analgesics and anticonvulsants, psychological measures including cognitive behavioral therapy and biofeedback, physical exercises, physical therapy, ice and heat application and interventional procedures. All these aim to help individuals who are greatly affected by the extreme pain that they have experienced because of their present health condition. One of the most effective ways to gather information about pain management is to access the pain management certification program offered by Brainmeasures and decide to take part in this popular online certification program. By enrolling in this highly effective pain management course, you can increase your chances of learning everything about this branch of medicine and how you can help anyone eliminate the pain that they have experienced. The program gives you the opportunity to enjoy a well-detailed pain management training which is proven to be really effective when it comes to explaining to you everything about the field including the scope of this branch, the different medical professionals who usually form part of a pain management team, the different approaches that are now used in this industry and how each of these are being implemented and the specific people and patients who can generate numerous benefits from undergoing pain management. Once you earn your pain management certificate, you will find it easier to help anyone who requires the excellent services of an effective professional in the pain management field. How does acute pain transition to chronic? How can you quantitatively and qualitatively assess pain? How to clinically apply epidural analgesia? 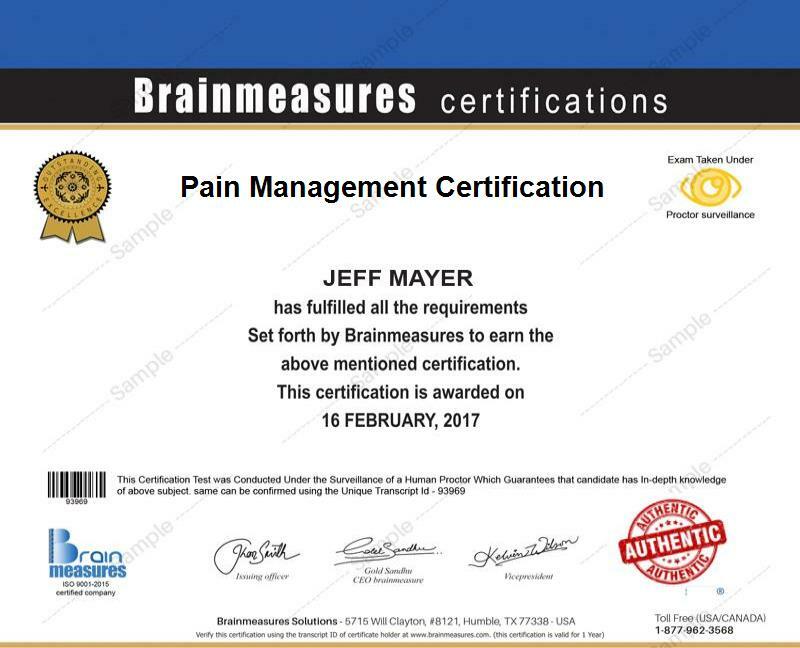 The pain management certification program which is now easily accessible at Brainmeasures is proven to be really comprehensive so expect it to be a huge help to hundreds of individuals and professionals especially those who are part of the medical industry. This program can be expected to work suitably for all medical practitioners, occupational therapists, physiotherapists, psychologists, clinical nurse specialists, mental health specialists, nurse practitioners and massage therapists. Earning a more stable income is also a great possibility if you are already a certified pain management expert. Your pain management certification course can definitely help you in getting the position of a pain management consultant which offers an average annual salary of $137,000. You can also use your pain management certification to work as a pain management doctor which lets you enjoy as much as $227,000 annually.